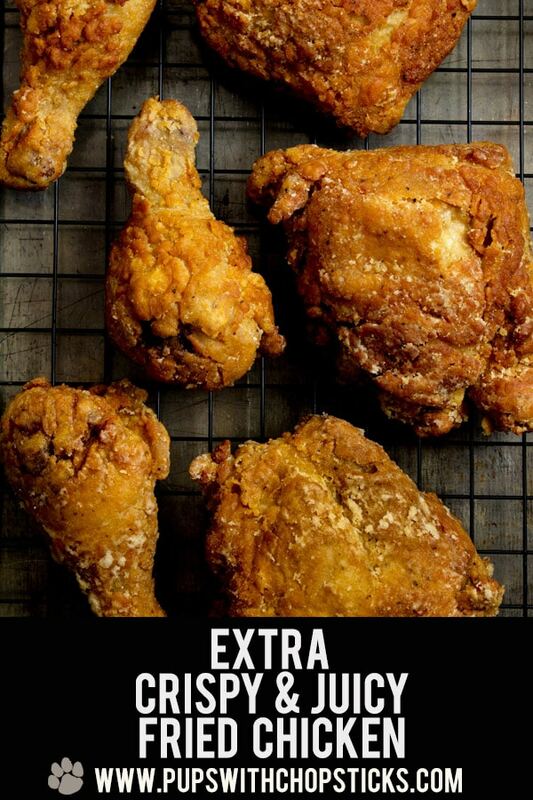 My ultimate crispy fried chicken recipe has only 3 main requirements. The crispy skin cannot fall off the chicken easily, or with one bite. Whenever you have a craving for some crispy fried chicken, whip up a batch (or 3), with dark meat, white meat (for chicken tenders) or wings! 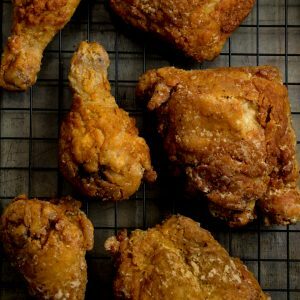 For this Super Crispy Fried Chicken recipe, all ingredients can be found at your local grocery stores. The key to a crispy chicken is adding a bit of starch into your flour mix. It can be either potato starch or corn starch but the chicken turns out a LOT crispier and stays crispier if you use potato starch. For the spices in the brine, you can pretty much go nuts. I like to add fresh garlic and a few bay leaves to keep things simple but if you’re feeling fancy, you can definitely add more exotic spices in as long as the salt to water ratio is 3-4 tablespoons to 8 cups of water. I keep this step optional because not everyone will want a juicy chicken and not everyone has the time to brine but whenever I fry chicken I definitely brine my chicken for a minimum of 4 hours. A Mix of Wet Batter & Dry Mix to Get More Flavor in the Crispy! For the wet batter, there is no egg in it, because I found egg gave me a gummier batter. I just decided to use the dry mix that we already have created, and just add additional spices, vinegar and water to it and lo and behold a wet batter! 🙂 It’s a thin batter and it’s meant to be just a thin coating. 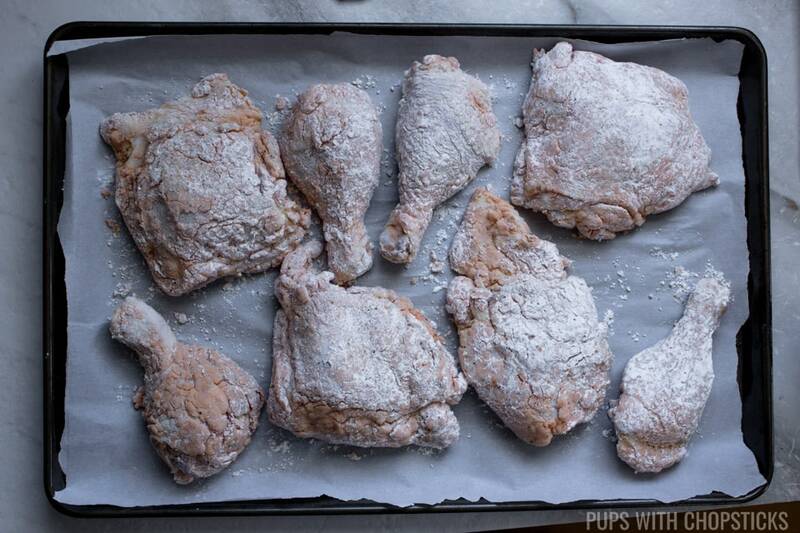 Make sure you dry the chicken REALLY well (with paper towel or air dry) right before you lightly coat it with the dry mix. This is a SUPER IMPORTANT step. Many people don’t mention this small minor detail but it makes a world of difference when it comes to making the crispy part stick to your chicken and well worth the effort if you don’t like your batter coming off easily and enjoy every bite of chicken to be crispy. 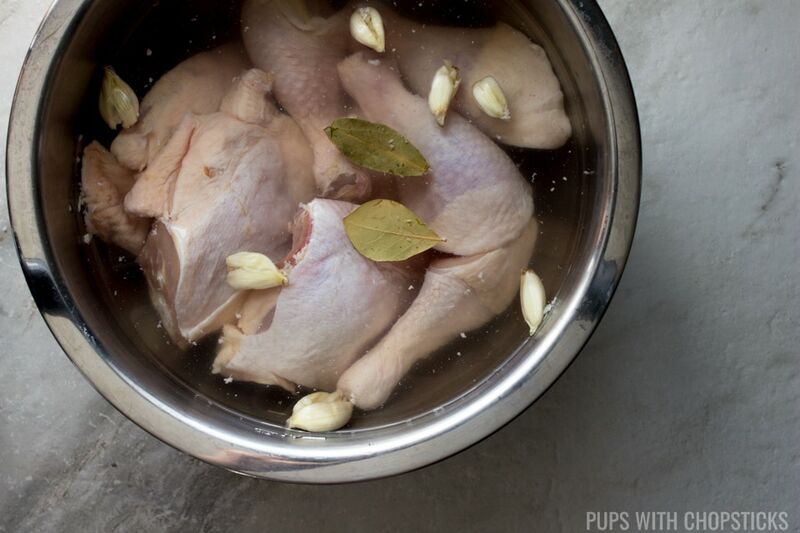 Once the chicken has been dried out, we are ready to lightly coat the chicken with the dry mix to remove the moisture from the skin even more from the starch and so that the wet batter will have something to actually cling on to and not just wick off the slippery skin. 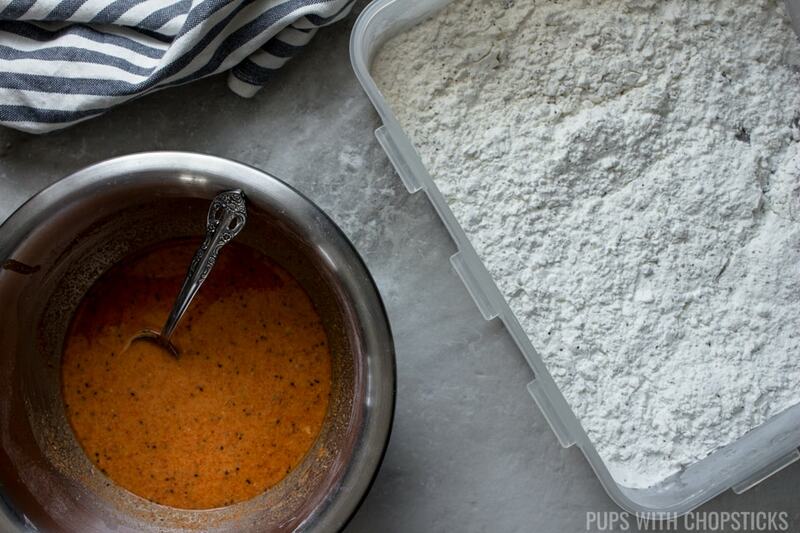 For the initial flour dunk, it’s important that you do a light coating only and shake off any excess mix – it’s meant to be a thin layer for the batter to stick to if this layer is too thick the wet batter will not stick to the chicken. Squeezing! When you are flouring the chicken for the second or third time, don’t be afraid to use your hands and squeeze the dry mix into the chicken. I like to do a pattern of: cover chicken completely in dry-mix, squeeze the mix into the chicken, shake off flour, and then repeaat again one more time. This gives the batter more nooks and crannies, which means more crispy! You can even add a few tablespoons of the wet batter into the dry mix, and using your fingers break up the wet batter into the dry mix. The added chunks will give the chicken even more batter. As time goes on, you will notice your dry batter will naturally have clumps from the wet batter anyways – just use your fingers and smush them back into the dry flour. While the chicken is resting, it is essentially drawing out the moisture out of the chicken which slightly dampens the dry layers. You’ll notice that coating becomes almost dough like – this will help you not lose all the batter into the oil during the deep frying phase. 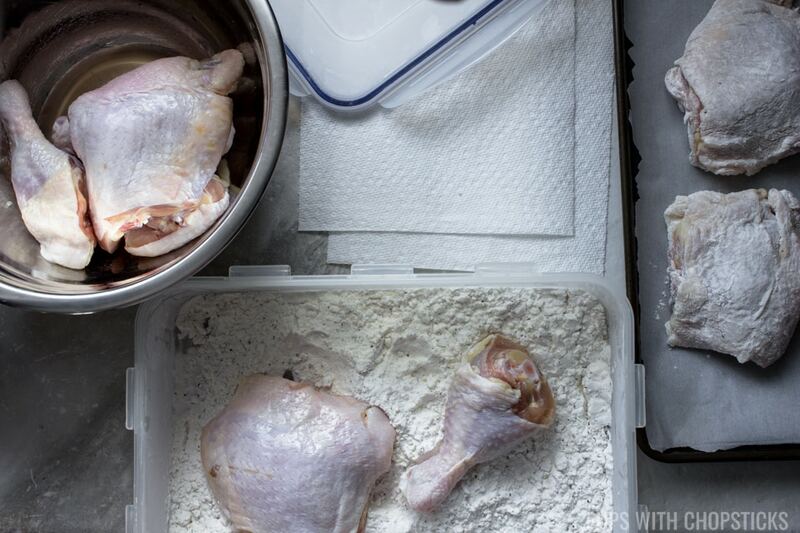 Letting your chicken rest is an important step so that your batter sticks even more to the chicken. 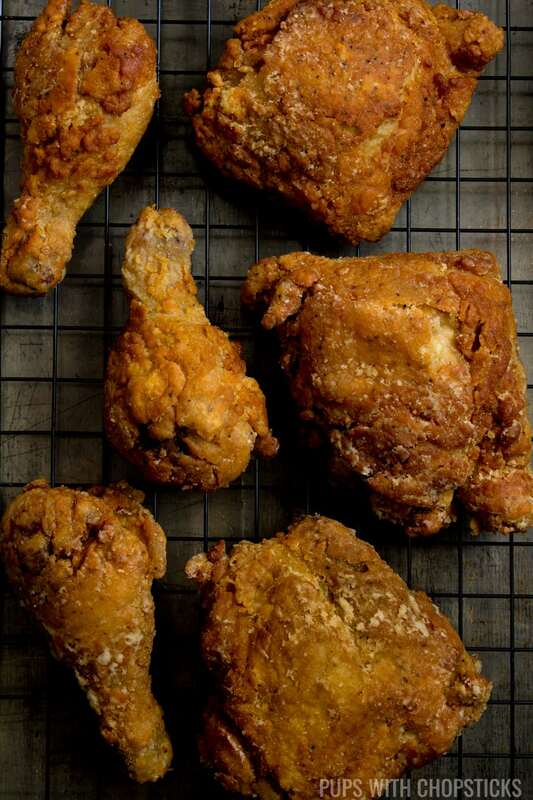 For this crispy fried chicken recipe, the temperature is important. I ate a whole lot of burnt crispy chicken with raw insides this year (blech) and I found that my biggest issue was the outsides were always cooking faster than the insides so I was getting a lot of dark brown (borderline burnt) crispy chicken with raw insides. Oil Temperature below 340 – This gave me a greasy feeling chicken, it was essentially oil logged. It was crispy, but not super crispy but the batter was not burnt and my chicken was cooked all the way. Oil Temperature at 360-375 degrees – This made my chicken super dark on the outside sometimes burnt and raw on the inside. My chicken would become dark brown within 3 minutes which is not long enough for chicken to cook all the way through. What Type of Oil Do You Use to Deep Fry? 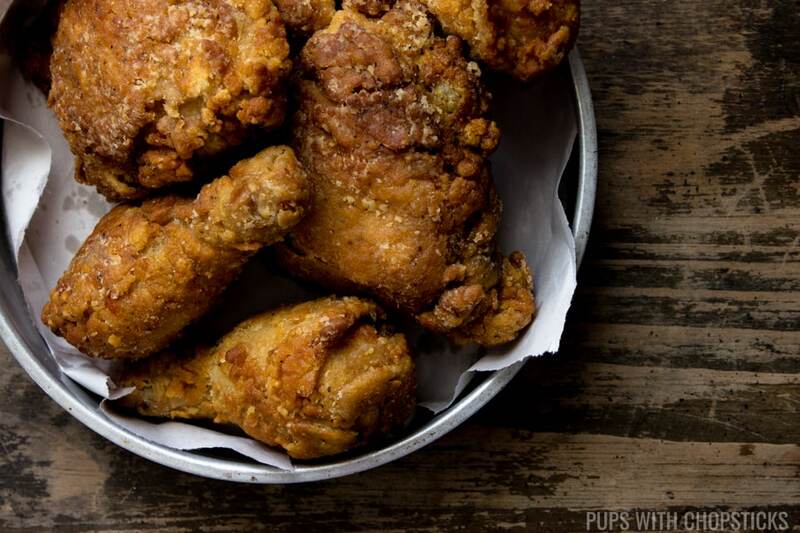 This crispy fried chicken recipe works well with wings and chicken tenders too! 🙂 Woohoo! In a large bowl, combine all the brine ingredients. If you are using chicken legs, separate the drums from the thighs so that it becomes 8 pieces of chicken. In a large Tupperware or bowl, combine all the ingredients of the “Dry Mix” from the ingredient list and set aside. (Optional) If you want a more textured crispy batter, add 2-3 tablespoons of the ‘Wet Batter’ into the dry mix work it into the mix with your fingers until you get a slightly clumpier damp dry mix. Scoop out 1/2 cup of the dry mix into a separate bowl and mix in the ingredients from the “Wet Batter” list and set aside. Once the chicken has brined for a few hours remove it from the brine and dry it out VERY WELL with paper towel. Pour the “Dry Mix” into a tupperware or a bag and put in a few chicken in at a time and shake the bag/tupperware to dust the chicken with it. Make sure you remove any excess dry mix from the chicken. You want a very light dusting on the initial flouring. Set the chicken in a single layer aside to rest for 5 minutes. Dunk one piece of chicken into the wet batter. Add the wet chicken piece back into the “Dry Mix” and completely cover the chicken in the mix. 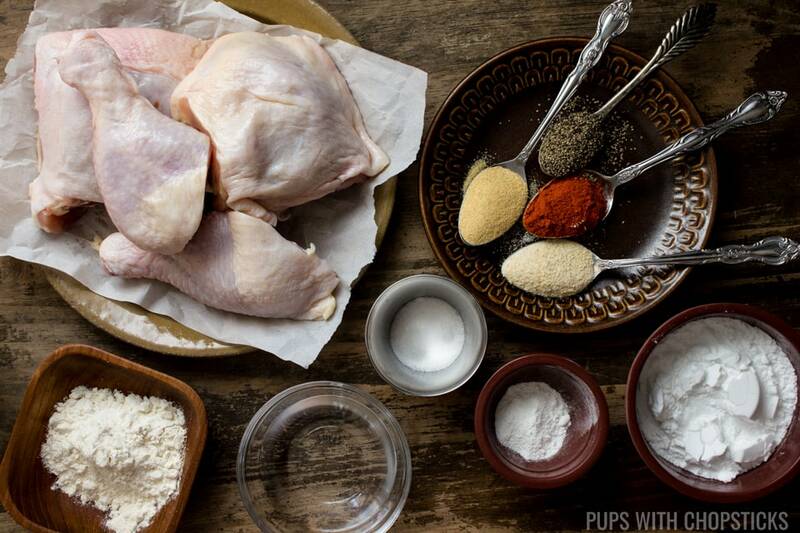 Use your hand and press the dry mix into the chicken and squeeze it into the chicken. 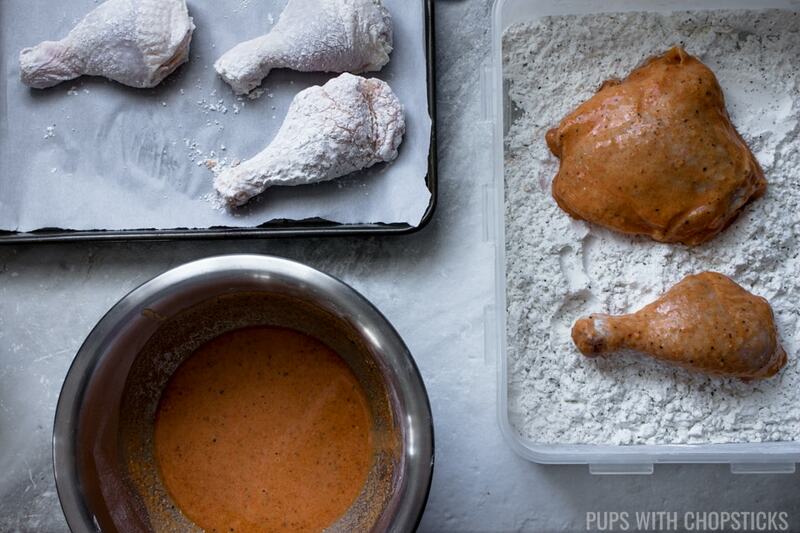 Remove the chicken from the dry mix and shake out the flour to create the nooks and crannies. Remove the chicken from the dry mix and set it in a single layer and let it rest for 10-15 minutes so it can stick to the chicken better. Repeat the above steps 5, 6, 7 and 8 for every chicken piece. Once the oil is hot (you can do a test if it’s hot enough by sticking a wooden chopstick or wooden spoon into it to see if it bubbles) add in the chicken slowly. Do not overcrowd the pan, you don’t want the oil temperature to drop. You may need to cook this in a few batches. Once it has cooked for 15-20 minutes, remove it from the oil and let it rest on a rack, newspaper or parchment paper for a few minutes before digging in. When you are coating your chicken in the dry mix, and you notice the batter making the dry mix clumpy – this is a good thing! You can run your fingers through the mix and smush the clumps to break them back down into smaller bits – these bits will be added textures for the crispy chicken. After you finish deep frying your chicken, it’s best to rest the chicken on newspaper, a cookie rack or parchment paper. Try not to use paper towel, the heat causes a bit of steam between the chicken and the wet paper towel. This is a whole lot of genius in one post. I have to wonder though. Who thinks juicy chicken is optional? Seriously. 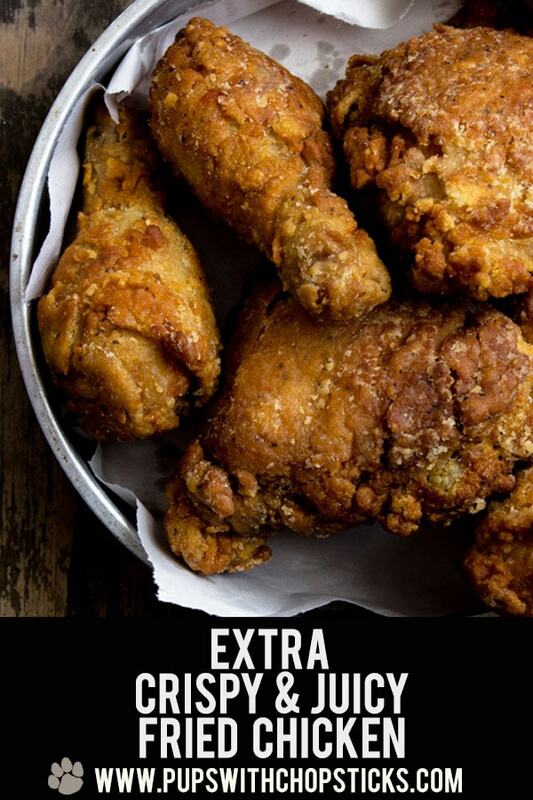 Nothing better than good fried chicken. And this is way better than just good! that is an awesome recipe and gorgeous shots of this chicken its perfect! 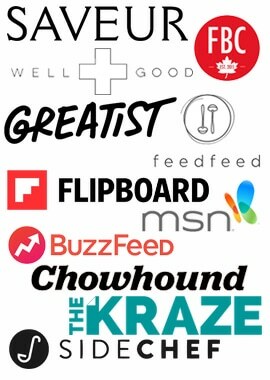 I like how detailed and thorough your recipe is with so many tips. Definitely would use this. I can see how crispy and fabulous the crust on that chicken is and it’s calling to me! This looks so good and I love the spices. What a delicious CHICKEN RECIPE! I simply cannot wait to try it! Very interesting combination of ingredients. I am saving this recipe for later. Oh my gosh! 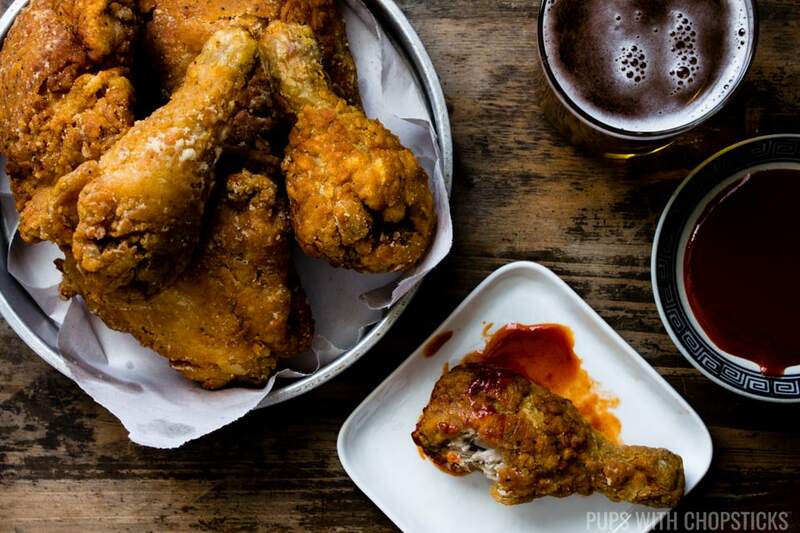 I’m totally drooling over this fried chicken recipe!